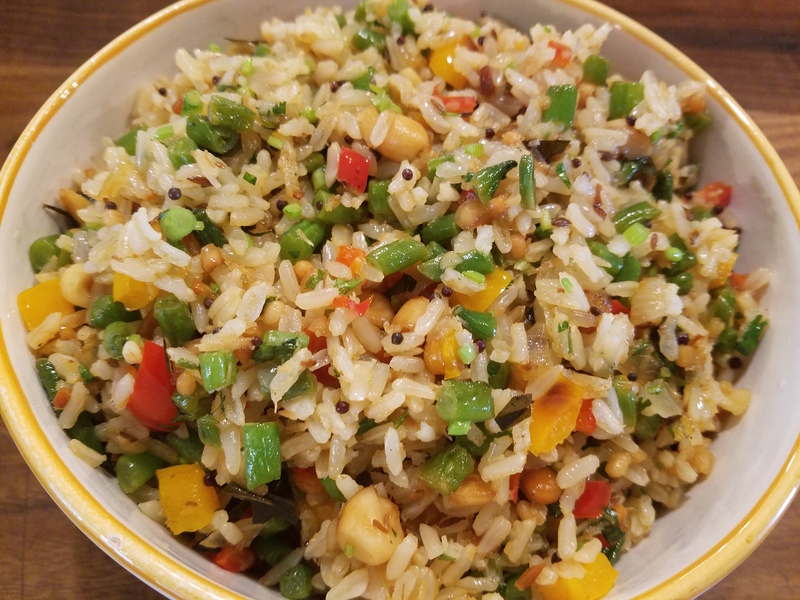 I love south indian style lemon rice… and make it often… so I was in the mood but wanted to make it healthier and filled with veggies- so I came up with this recipe… I cooked it with brown rice and added peppers and green beans.. check it out- it is yummy! Transfer the rice to a heavy saucepan with the oil and sauté on medium heat for a minute. Add the salt and water, bring to a boil and cover partially with a lid and lower the heat to a low medium. Continue cooking, about 15 minutes till all the water is cooked off from the surface. Place the lid on the pan and lower the heat to a very low and continue cooking for at least 20 minutes or till cooked. Fluff with fork and let cool. Add the oil to a wok like saucepan with the mustard seeds, cumin seeds, curry leaves, moong dal, channa dal, coconut and peanuts. Saute on medium heat for 2 to 3 minutes, stirring constantly. Add the onion and ginger and sauté for another 2 to 3 minutes. Add the red pepper and green beans and sauté for another 2 to 3 minutes. Add the cooled brown rice, salt and lemon juice. Saute for 3 to 4 minutes, check for seasonings and finish off with the cilantro. Serve with grilled meats or lentils. Transfer the onion, garlic and ginger to a processor and process till finely chopped. Heat a large frying pan with the ghee/butter. Add the cumin, cloves and cinnamon. Saute on medium heat for 30 seconds. Add the onion mixture and sauté on medium heat, stirring constantly for about 5 to 7 minutes. Add the tomato puree, salt, turmeric, cayenne pepper and coriander and sauté for another 5 minutes. Add the paneer and cream. Bring to a boil and lower heat to a simmer and cook with lid on for 5 minutes. Add the frozen peas, cover with lid and cook for another 5 to 6 minutes. Check for seasonings and garnish with cilantro. 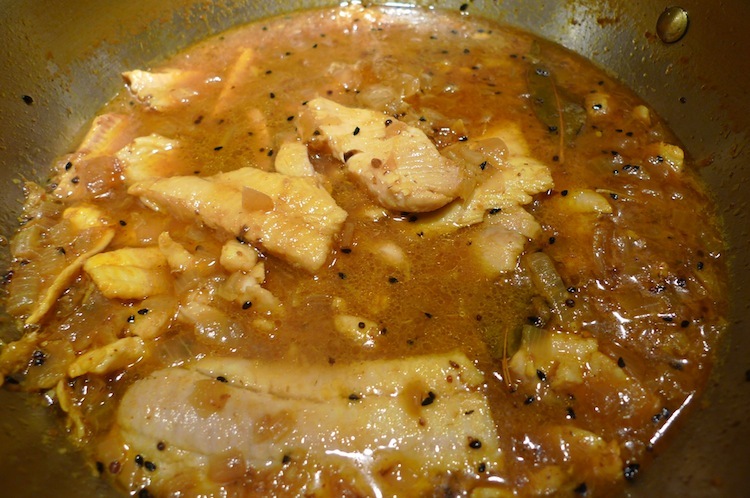 Marinate the chicken pieces with the lime juice, salt, coriander and cayenne pepper for 2 to 3 hours. Heat a large saucepan with coconut oil. Add the fennel seeds, curry leaves, onion, Serrano pepper and garlic. Saute on medium heat for 4 to 5 inutes. Add the turmeric, coriander powder and a teaspoon of salt. Saute on medium heat for another 3 to 4 minutes. Add the chicken with the marinade and bring to a boil. Lower the heat to a simmer and cover with lid and cook for about 15 minutes. Take the lid off and let the chicken simmer on medium heat for another 5 to 6 minutes. Check for seasonings and garnish with garam masala and cilantro. 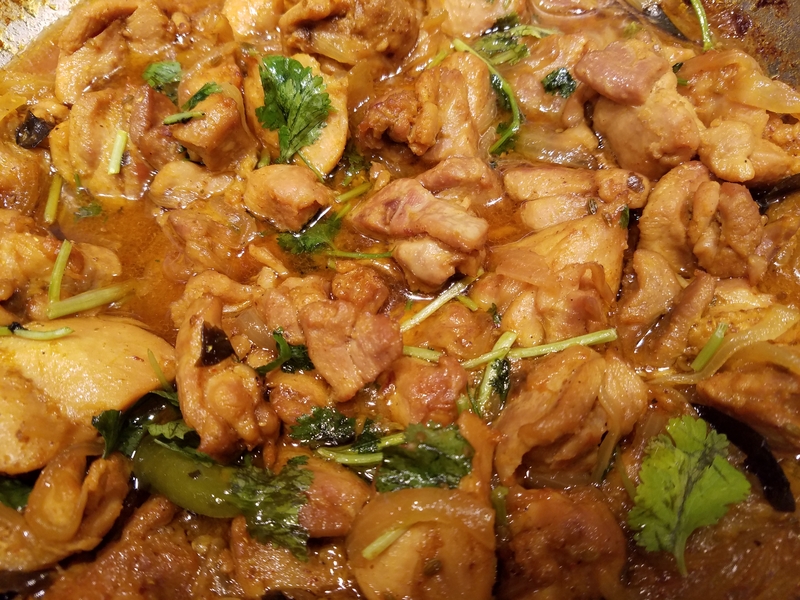 Serve with rice and roti. I love making noodle and rice bowls and so I thought why couldn’t I make one with Indian ingredients.. that is how this bowl came about. If you want to leave it completely vegetarian and more vegan, eliminate the egg. Transfer the tomatoes, onion, garlic and ginger to a blender. Blend well till everything is well combined and formed into a sauce. Keep aside. Heat a pressure cooker to a large saucepan with the butter. Add the cumin seeds, cloves, cinnamon stick and bay leaf. Saute for 30 seconds on medium heat. Add the drained chickpeas, tea bag, salt and water. Bring to a boil and follow directions for the pressure cooker and cook under pressure for 2 hours. If using a regular saucepan, cook for 2 to 3 hours or more depending on how long the chickpeas were soaked. Keep adding more water as needed. Once the chickpeas are soft and tender, bring to a boil and cook till a thick soup consistency if formed. Check for seasonings and garnish with garam masala. Heat a medium saucepan with the butter. Add the rice and salt and sauté for a minute. Add the water and bring to a boil. Partially cover the saucepan with lid and cook on medium low heat till most of the water is cooked away, about 15 minutes. Cover with lid and lower the heat to low and cook for another 20 to 25 minutes or till the rice is cooked through. Fluff rice with fork and let cool. Heat a wok like pan with the coconut oil. Add the cumin seeds, mustard seeds and curry leaves and cook for 30 seconds on medium heat. Add the onion and garlic and sauté for 3 to 4 minutes on medium heat. Add the spinach and let it wilt, add the cool rice and soy sauce. Cook on high heat for 3 to 4 minutes. Add salt if needed. Mix everything together and keep aside. 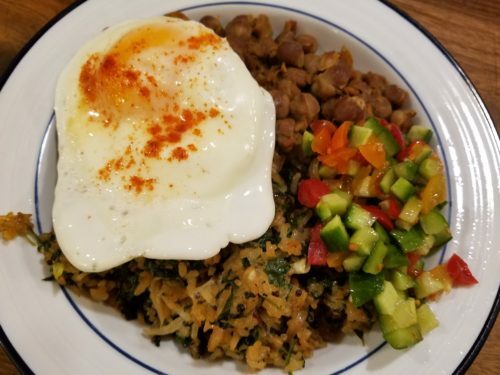 Assemble bowls with the spinach rice, channa masala and relish. 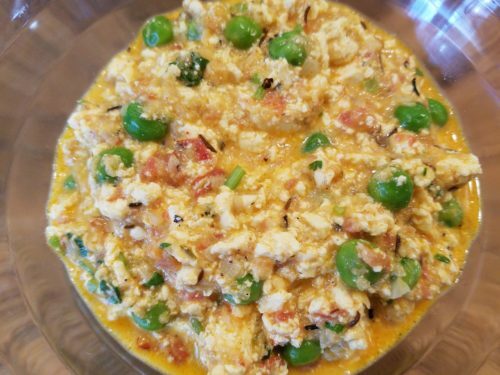 Top with fried eggs if desired and garnish with some chili sauce. Transfer the drained cashews, cream, onion, tomato, ginger and garlic to a blender. Add some water if necessary and blend till a smooth paste is formed. Keep aside. Heat a heavy saucepan with the oil. Add the bay leave and cinnamon stick and sauté for 20 seconds. Add the cashew paste and sauté on medium heat for 10 minutes. Add the cayenne pepper, turmeric, salt and water. Bring to a boil and simmer for 10 minutes. 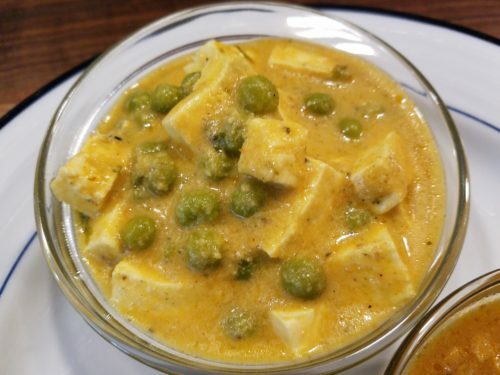 Add the drained paneer and peas and bring back to a boil and simmer half covered with a lid for 10 minutes. Add the kasuri methi and cilantro. Check for seasonings and serve warm. Mix the yogurt, sour cream, half and half, onion, garlic, ginger, salt and cayenne pepper in a medium bowl. Add the chicken pieces and marinate for at least 2 to 3 hours if not over night. Blend the cashews with the water into a paste. Keep aside. Heat a deep saucepan with the oil. Add the cumin, cardamom, cinnamon and cloves. Cook on medium heat for about 30 seconds. Add the onions, garlic, cashew paste and cook medium heat for at least 20 minutes, stirring constantly. Add the chicken with the marinade and bring to a boil. Lower the heat and cover and cook for 20 to 30 minutes. Check every 10 minutes, making sure it doesn’t stick to the bottom of the pan. Take the lid off and turn the heat up to medium high and let the excess moisture evaporate- another 10 minutes stirring constantly. Check for seasonings and garnish with cilantro.